Neon paint can also be found at Michaels Craft Store. However, it is more expensive. You can either mix the paint in before you cook it or add it to the dough after. I added it to the dough after. Next time I will definitely add it to the mixture before cooking. This will work under the use of a black light. Here are some of our other favorite glow activities. Letters in a different "light"
Such a fun idea. 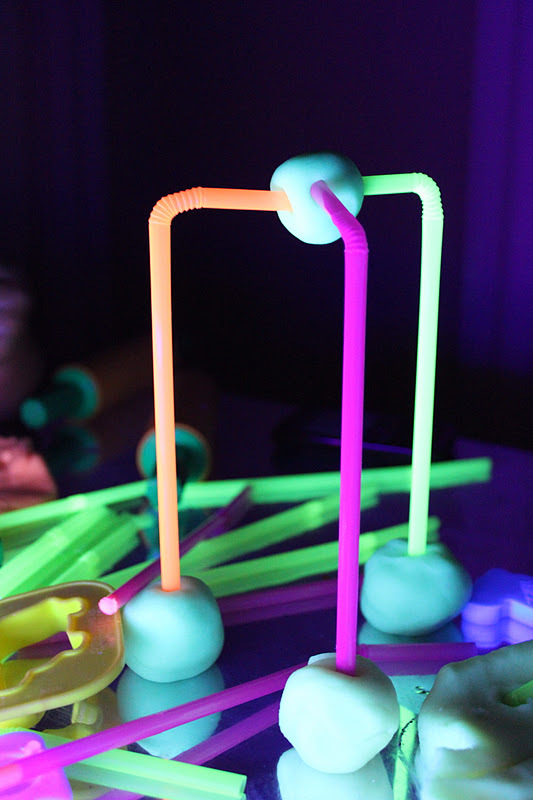 How did you set up the black light? I think this would only work for us at night or in the early morning. Otherwise, every room has light coming in and our bathrooms aren't big enough. You could do it on a little lap desk, end table or small kids table in a little pop-up play tent or blanket fort. Or pin up thicker blankets or towels over the windows to make the room darker. This makes for awesome photos too! I wish I could give all of you big hugs! I'm 21, not a mom yet, but I'm studying to be an occupational therapist. I found your blog through pinterest and I'm obsessed! I've been exploring it for hours and I'm so impressed! I think everyone with children should be aware of these activities, especially with how easy to do yourself you've made them! I love it! I wish I had kids to do these activities with. PLEASE keep the posts coming! Thank you for the kind words Hailee. am sorry that you are losing followers due to something completely out of your control. I,too, am so ready to move on and focus on what I can control! I am sure you hear this all the time, but I want you to know that your blog completely changed my family's lives! last year we adopted a sibling group of three and were also surprised with a miracle baby born 8 weeks too early! My husband and I went from a family of two to a family of six in less than a year! I went crazy finding every "popular" toy to make our house feel kid friendly! After teaching for 10 years I should have known better,kids learn more and experience more growth when they are participants AND directors of their learning and play. My sister first referred me to your blog when my son was diagnosed with Autism and our consultant gave me some feedback about the play environment I had created and the lack of creative play options. We had a million toys that were loud and shiny and flashy-but very few of them had multiple options for play! Initially I hated your blog because it was a daily reminder of the easy, accessible, creative experiences I could be providing my kids instead of the limited imagination toys I had been relying on. I am now a changed woman! We are totally revamping our home and making it more of a place where play and learning can happen at the same time! Thank you for your inspiration! Ha! Thank you for understanding my "hatred" was really just my unwillingness to self reflect! I am staying home for a couple of years to work with my kiddos 1:1....but your blog is getting me so excited to get back in the classroom with a whole new attitude about play! Sorry to bother you! But, as a SAHM with limited time I am having trouble searching your site quickly...but I know what I am looking for as I read it here recently. Can you guys add a Search Gadget so that we can look for specific posts? Thanks!!! I love your ideas..just curious on how you took these pictures. I'm guessing nonflash. I can't wait to do this. Thank you for sharing. @Team Blunt.... yes, just no flash. @Amanda.... Thank you for sharing. We appreciate it. hi - I love this post! question: does the dough glow indefinately or just for the first few hours? I love your blog too! I've devoted Mondays to craft dcay and we're going to try to all your projects. Thank you sooo much! Quick question..I added the florescent paint before cooking and it doesn't glow under a black light or at all...any ideas?? I used a full package of that paint ( maybe 8 oz) and added it to your playdough recipe. I wonder if it is bc I added it before cooking?? This reminds me of college. We would write on the walls with liquid Tide, which only shows up when exposed to black light. Love your blog! Great ideas! Wish I were half as organized! We loved this activity and featured it at our blog, MPM School Supplies Blog! We were sure to give idea/photo credit, as well as a link back to your blog, but we'd love for you to check it out! If there are any problems, we'll be certain to take the feature down immediately! Hi, could you tell me what kind of black light you used? Just a bulb or a tube light? I bought two bulbs and they didn't work very well, I even moved one to a clip lamp on the table. But even the kids clothes didn't glow like they normally do under black lights. I just bought these at Wal-mart, not sure if there is a specific type I need to use? Thanks!! It's a tube light that I bought off of amazon. I think the brand is America DJ?? I also have one from Spencer's that works well. Will this glow at all if we just turn off the lights or does it specifically need a black light?